The Comenda Grande agricultural project was launched by Maria José de Almeida Margiochi, granddaughter of José Maria Eugénio de Almeida (who set up the Eugénio de Almeida Foundation) and daughter of Gertrudes de Almeida Margiochi and Francisco Simões Margiochi , with the latter proving one of the most renowned figures in 19th century Portuguese agriculture, a period when he picked up countless national and international awards and prizes, or his farming related activities. This landmark estate belonging to the Margiochi household, inherited by Maria Madalena de Noronha and her husband João and today continued by her daughter Maria de Lourdes S.A. de Noronha Lopes and her husband Engineer António Lopes and their children across an area spanning 750ha and accompanying the reconversion process undertaken by the Alentejan agricultural sector and correspondingly making significant investments to this end. Thus, in addition to the incorporation of part of the rainfed lands into the irrigated extent, this involved expanding the forested areas and prioritising the cork oakmostly cork oak Quercus Suberas well as installing 43ha of vines on outlying fields and planting a modern olive grove over around 30ha. The decision to cultivate vines essentially stemmed from resuming a historical activity on the estate while also taking advantage of the installations available at the ancestral “monte” (traditional Alentejan farm) made possible by cutting back on cereal production and also reflecting the wonderful prevailing conditions for the vines. 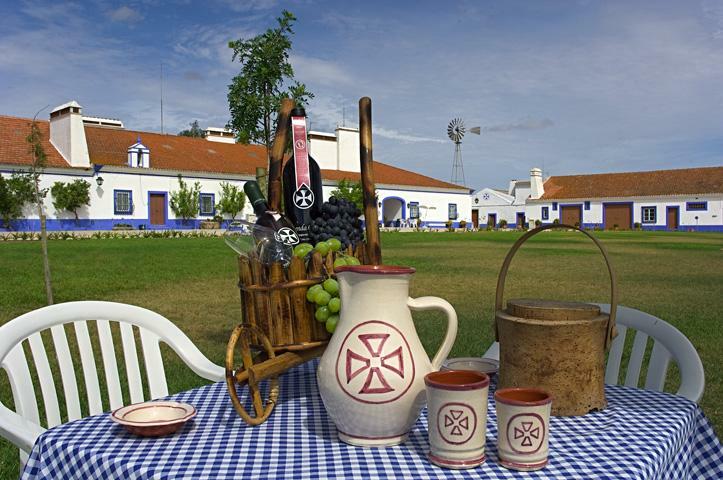 The vineyard, which covers around 36ha, in addition to its red varieties, grows white wine grapes on 7ha and favouring the leading varieties special to the Alentejo: Trincadeira and Aragonez for the reds and Arinto and Antão Vaz for the whites. These stand alongside the cultivation of other varieties in smaller quantities in order to generate added value through differentiation and including the following: Alfrocheiro, Tinta Caiada, Alicante Bouschet, Cabernet Sauvignon, Touriga Nacional, Syrah and Baga for the reds and Verdelho, Sauvignon Blanc and Roupeiro for the whites. Whether in the vineyards, through the careful selection of variety and rigorous supervision and control over production, or in the winery, through recourse to the most modern technological means and their closely targeted deployment, this process 'designs' wine profiles that seek to maximise the best of the existing conditions whilst striving for elegance and harmony between the grape varieties and the prevailing terroir, and simultaneously reaching out to meet current consumer expectations. Our team of oenologists was founded by Professor Colaço do Rosário and Engineer Francisco Pimenta, who came up with wines both of great quality and uncommonly distinct. There thus came the Comenda Grande white combining the fruity exuberance of Verdelho and Antão Vaz and the freshness of Arinto and the Comenda Grande red with its imposing colour revealing the Alicante Bouschet variety whilst its very mature notes of fruits and raisins derive from the characteristics particular to the Trincadeira and Aragonez varieties combining with the tannins from the young wood maturing process that enhances the overall effect. In exceptional years, the Comenda Grande Reserve red goes into production and involving an association of varieties only growing in the best years and matured in 1,000 litre French oak casks and thereby obtaining, beyond a deep harmony in the combination, a very particular personality and from the outset a very robust wine, concentrated but highly refined and displaying all the best characteristics of grapes that achieve excellent states of ripeness.